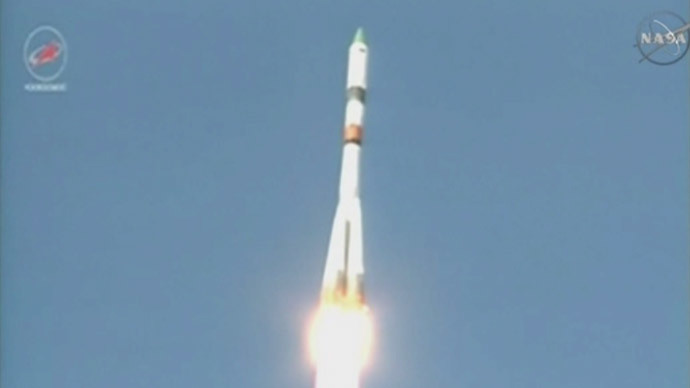 Progress, propelled by a Soyuz space rocket, lifted off from the Baikonur Cosmodrome in Kazakhstan on Tuesday. Thirty minutes after the vessel separated from the rocket's third stage, it became clear that ground control was only receiving partial telemetry feedback from it. It later turned out that Progress rose to an orbit about 40 kilometers higher than it was supposed to. Video from an onboard camera showed the vessel was spinning quickly. The reasons for this are still being determined. Early media reports suggested that ground control had completely lost contact with the vessel, some alleging its solar batteries or docking antennae had failed to unfold. These fears were dismissed by Igor Burenkov, an official representative of the Russia's Roscosmos space agency. "The current situation with the 'Progress' vessel is clear. It has been put in orbit as normal," he told RT. "We are only receiving partial telemetry. This is what's causing questions, because we would like to receive full data. This is what our specialists are now working on." The Progress vessel is capable of autonomous flight for a certain period of time, which is usually enough for ground control specialists to investigate and fix any issues. This is exactly what they are doing now, according to Igor Burenkov. "We have radio contact with the ship, we know where it is. Earlier reports that the ship was all but lost have no basis so far. Of course, the situation is not simple, but we are working on resolving it." Burenkov said the main priority now is to dock the ship to the International Space Station, which can be done manually. To that end, Roscosmos specialists have switched from the normal six-hour docking procedure to a backup two-day one. The spacecraft is carrying 2.5 tons of cargo for the multinational ISS crew. The supplies include oxygen, food, fuel, equipment for scientific experiments, as well as personal packages for the cosmonauts and astronauts. If Progress ultimately fails to dock, the crew are not in danger. The ISS is always stacked for several extra months in case a supply run goes wrong.